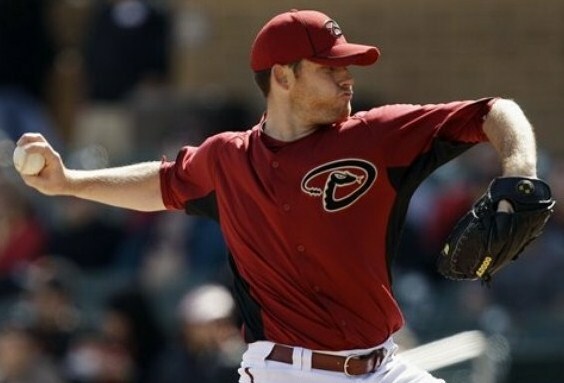 The Arizona Diamondbacks took three of four games against the San Diego Padres at Chase Field. As the weather in Arizona finally starts to drop below triple digits, the Diamondbacks remain red-hot. They continue to pull away from the San Francisco Giants, who are now 8.5 games behind in the National League West. The Diamondbacks are only half a game behind the Milwaukee Brewers for second place in the National League. If they pull ahead of the Brewers by the end of the regular season, they will play the Atlanta Braves with home field advantage in the first round of the playoffs. If they cannot pass the Brewers, they will be playing the Philadelphia Phillies, who will have home field advantage. As part of the ten-year anniversary of 9/11, and the Diamondbacks World Series Championship, they wore their retro uniforms from 2001 Friday through Sunday. The Diamondbacks had just taken three games from the Padres at home two weekends ago. Game one was Thursday, and the Diamondbacks won 4-1 behind ace Ian Kennedy, and his National League leading 19th win of the season. He pitched 7 2/3 innings striking out 11 batters and not giving up one walk. Home runs by Paul Goldschmidt and Justin Upton were more than enough to seal the victory. Two additional runs were tacked on in the bottom of the seventh inning as the Padres scored their only run in the top of the eighth. Closer J.J. Putz got his 38th save of the season when he closed out the ninth inning. 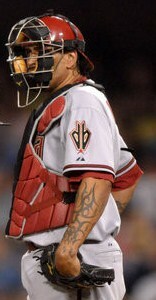 Friday night, the Diamondbacks wore their flashback uniforms to celebrate their 2001 World Series Championship. Although the Padres scored the first two runs of the game, the Diamondbacks scored the final three, for another come-from-behind win. Daniel Hudson followed up Ian Kennedy’s performance with a two run complete game, allowing only five hits with seven strikeouts and two walks. The Padres scored their second run of the game in the top of the sixth. Justin Upton responded by hitting a home run in the bottom of the sixth. This was his second home run in as many nights, and it closed the score to 2-1. A Chris Young double and Gerardo Parra triple tied the score 2-2 in the seventh inning. After a lead-off walk in the eighth, Miguel Montero and Lyle Overbay singled, which scored Aaron Hill and gave the Diamondbacks the win 3-2. The Diamondbacks honored the 2001 World Series Championship team before their game against the Padres Saturday night. During the game, the Diamondbacks showed their resiliency with another come-from-behind win in extra innings. 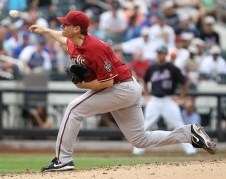 The Diamondbacks headed into the ninth inning down 5-3 facing Heath Bell, one of the best closers in baseball. Two batters later, the scored was tied at five with back-to-back home runs by Chris Young and Lyle Overbay. The game ended in the bottom of the tenth inning when Overbay was walked with the bases loaded, scoring Justin Upton. A sellout crowd of 48,017 was on hand to see the game, and the ceremony honoring the 2001 World Series Championship team. This was only the second sellout of the season. The win was a franchise record 15th home win in a row. Before the final game of the four game series, the Diamondbacks performed a wonderful tribute to the fallen heroes on the tenth anniversary of 9/11. The Padres took a 7-0 lead going into the bottom of the sixth inning. The Diamondbacks rallied by scoring five runs off of a Henry Blanco home run, three singles, a double, and a walk in that inning. After finding themselves still down by two runs, the Diamondbacks could only muster up one more run in the seventh, and lost the game 7-6. Starter Josh Collmenter had a rough outing as he only got through four innings and allowed six runs. The Diamondbacks lost their first home game in their last sixteen, but won the series against the Padres 3-1. They will travel to Los Angeles to take on the Dodgers in a three game series beginning tonight. The magic number for the Diamondbacks to win the National League West Division is any combination of eight wins or eight San Francisco Giants losses, with 15 games remaining. ~ by Troy Erickson Realtor on September 12, 2011.